A Roman tile kiln in the garden of a large house, "Rosehill", Doods Road, Reigate. The structure included a square stokehole, c4.5 x 3m, a fire tunnel 2m x 3m (with a vaulted bore c1m across) and a combustion chamber c4 X 3.5m comprised of seven cross-walls, 7 X 2 diagonal flues and an end wall. No trace of a kiln floor was identified. The entire structure was made of pedales set in unfired clay, except for sesquipedales that pave the fire tunnel and project into the stokehole to provide a 'hard' for shovelling. The tunnel entrance was flanked by two substantial piers comprised of ashlar Upper Greensand blocks surmounted by at least ten courses of pedales, and substantial quantities of rougher blocks were used to backfill the gap between the kiln structure and the hole dug to accommodate it. This is the earliest known use of Upper Greensand as a building material. From beneath the tile paving of the fire tunnel ran a line of box flues that served as a drain. Some of box tiles were combed and others roller-stamped. It is not certain what type of ceramic building material was made in the kiln, unless the backfill debris in the stokehole fill is representative. Tegulae seem dominant, followed by pedales and imbrices. Flue tiles are conspicuous by their near absence, and the rare examples are all combed. A few small spicae were also recovered. 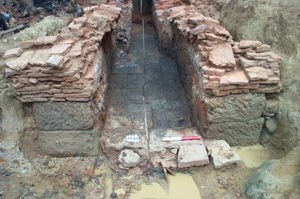 Basal layers in the stokehole provided sufficient sherds of pottery with which to date the structure to the later 2nd or 3rd century, but samples taken from the walls of the combustion chamber should provide a more definitive archaeomagnetic determination. A little further south from the kiln a spread of wasters has also been extensively sampled. Although roofing and floor/wall tile is still common, there are very many more pieces of flue tile; mostly combed, but some roller-stamped; and a few spicae. No voussoirs have been identified either here or the stokehole dump. 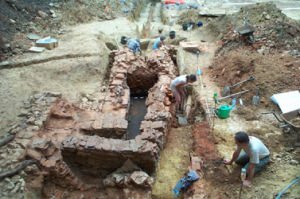 The latest excavation follows previous work undertaken in the area and discoveries dating back to the mid 19th century (Masefield and Williams 2003), but this is the first complete kiln to have been recorded.